GRA Board Chairman, Rawle Lucas. The Guyana Public Service Union (GPSU) on Friday slammed Chairman of the Governing Board of the Guyana Revenue Authority (GRA) for a slump in worker morale and the wanton dismissal of experienced staff. “The external interference of Mr. Rawle Lucas, Chairman of the Governing Board of the Revenue Authority has moved the environment of the organisation to a hostile and insecure one for staff at all levels evidently resulting in low morale and motivation,” the union said in a statement. When contacted, Lucas declined to comment on the accusations leveled by the GPSU which has long represented GRA workers. The GPSU said it has since complained to President David Granger; Minister of Finance, Mr. Winston Jordan and the Attorney General, Mr. Basil Williams. The Finance Minister’s portfolio includes the GRA. Vowing to support GRA workers who are “currently being confronted with unwarranted challenges,” the union suggested that Lucas might have violated the law. “The actions taken by the Chairman, particularly those recently executed may be deemed excessive and above that authorized by Act No. 13 of the Revenue Authority Act 1996 Revised Edition 2004. “Further, there seems to be the continued culture of the past to effect promotions which disposed experience and qualified staff, and to terminate and dismiss staff at will and without due process,” the GPSU said. The Union said it was also offended with the unfair categorization of the staff as being untrustworthy and apparently undermining authority and revenue targets, which by virtue of their employment are their fundamental roles. The Chairman of the Governing Board has already defended his decision to have an office and a personal assistant based at the Critchlow Labour College, Woolford Avenue where she analyses and summarises documents for board meetings and researches issues and developing briefs for him. Lucas has already noted that the Board Secretary’s office has been broken into in an attempt to access sensitive and confidential taxpayer information which goes to the Board. “GRA had to take extra measures to protect the office of the Board Secretary and its information from its own staff since the act was considered an inside job. 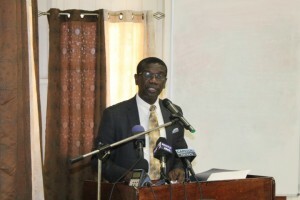 I therefore do not have anything further to say about trust and confidentiality at GRA and the extent to which staff members are harassed to violate taxpayers’ privacy,” he has said in a letter in response to several allegations. The Chairman of the GRA’s Governing Board has said that he has agreed to be paid a monthly taxed stipend of GYD$10,500 as that office holder, and provided with a GRA car that he returns after working for that revenue collection agency.